Legend from the Hattite people of central Turkey relates how the storm god Teshub did battle with the water dragon Illuyanka — and lost. To keep his enemy down, Illuyanka took out Teshub’s eyes and heart. Teshub was forced to depart, blind and humiliated, but it isn’t that easy to kill a god. Once he’d nursed his wounds, Teshub devised a strategy for healing and revenge. He courted the earth goddess, Hebat, married her, and sired a son named Sarruma. Sarruma grew up to become a mountain god. In the way of the times, Teshub negotiated a marriage for Sarruma. The bride was Illuyanka’s own daughter! Teshub prevailed upon Sarruma to ask his new father-in-law for a nuptial gift — the eyes and heart of Teshub. Illuyanka agreed, though one suspects with some hesitation. Thus Teshub’s strength and eyesight were restored. The marriage went forward, but after some time Teshub confronted his old enemy once again. The battle raged, and this time Teshub gained the upper hand. At the last moment, Sarruma came to the field. He must have become fond of Illuyanka, for he was enraged to realize his father had used him in a scheme for revenge against his wife’s father. Sarruma cried out, “If you kill him, you must include me. Show us no mercy!” And Teshub showed no mercy. He killed both Illuyanka and Sarruma with a storm of lightning and thunder. Can you imagine the conversation between Teshub and Hebat afterward? “He told me to do it, honey.” It just goes to show that the Greeks didn’t have a lock on the highest drama in mythology. I’m always excited to discover a dragon legend that I hadn’t heard before, and I can hardly wait to share this one with you. Teshub (a.k.a. Tarhun, Tarhunt, Tarhuwant) was a storm god of the ancient Hurrian and Hittite cultures. These were very late Stone Age and Bronze Age civilizations, flourishing in central Turkey beginning about 2,200 BC. This makes them contemporary with Mesopotamia, a culture more widely taught in US Schools. The Hurrians blended with their neighbors and became the Hittite civilization by about 1,600 BC. What’s interesting about the Hittites is that they are mentioned in the Old Testament of the Christian Bible but so little was known about them that many archaeologists believed they were actually a mythical race. In the mid-19th Century, though, archaeologists began to make discoveries that revealed the Hittites to be equivalent in power with Egypt in that era. So Teshub was a god of storm and sky. He’s recognizable by carrying thunderbolts and riding a carriage drawn by bulls. In the Hurrian mythos he was married to the mother goddess Hebat. The Hittites paired him off with the sun goddess Arriniti but maintained much of the bull imagery. Illuyanka was a dragon deity, enemy of Teshub. Parts of his name come from the word “eel,” so perhaps he was a water dragon. The reason for the battle is lost to time, but Illuyanka and Teshub fought fiercely. Alas, Illuyanka was victorious. To punish his enemy, he took Teshub’s eyes and heart. It isn’t that easy to kill a god, though. Come back next time to learn about Teshub’s come-back plan. I noted in my last post that I attended the RadCon science fiction convention last weekend, in Pasco Washington. A wonderful time was had by all (until the last bit, when I fell and chipped my shoulder) and of course there were dragons! I got permission from a few of the artists to photograph their work. 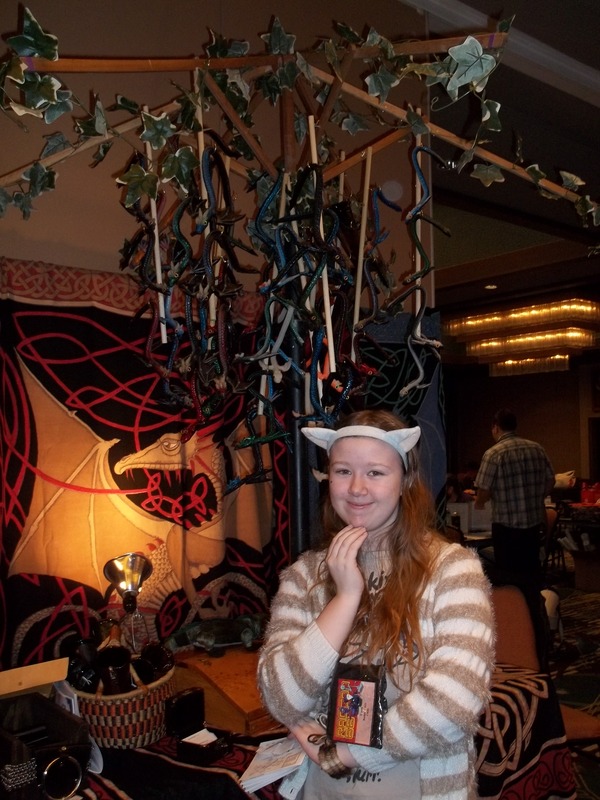 Picture #1 is actually a whole tree-full of little bendy dragons. You can see them dangling above my daughter’s head. Picture #2 is the one she bought with her spending money. Cute, isn’t it? 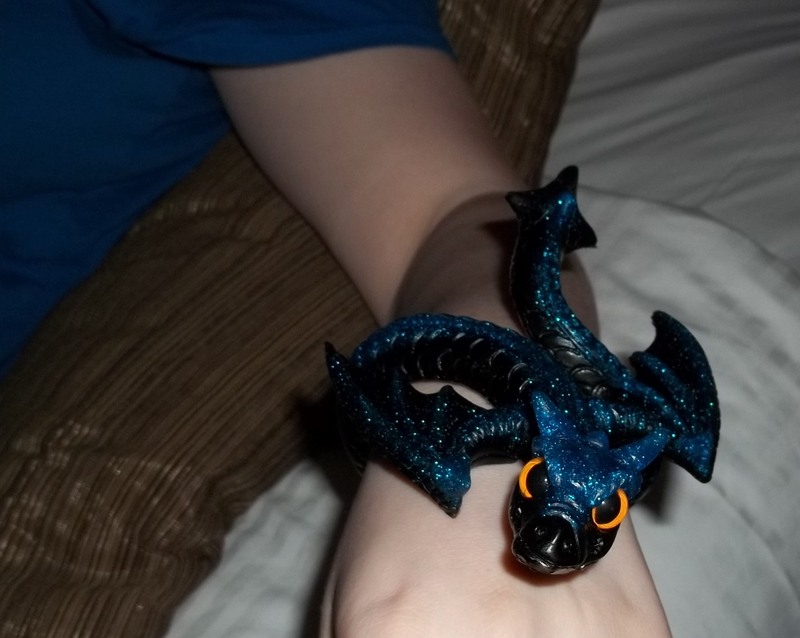 These are produced by Dragonpets. Their web site includes armor and similar accessories. 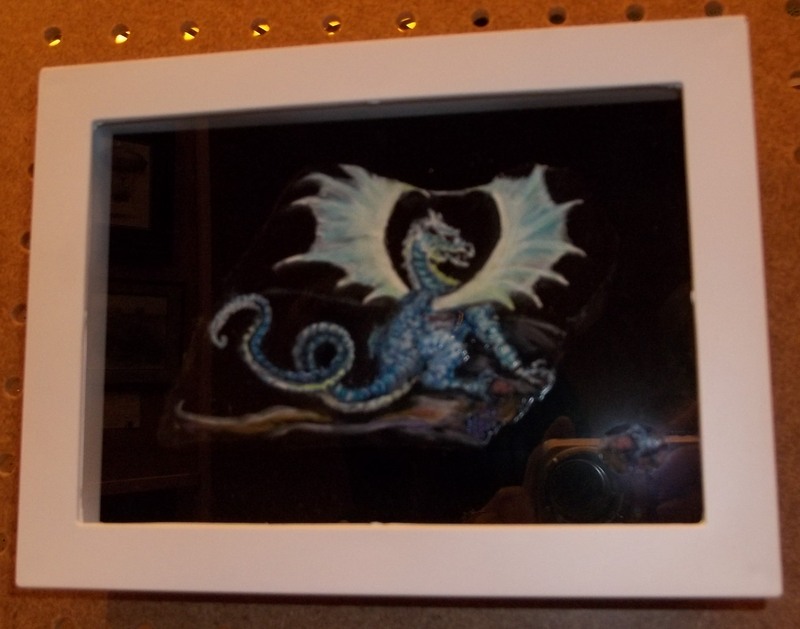 Picture #3 is a dragon painted on an agate stone, by my good friend Betsy Mott. Naturally there were a lot more dragons in the art show, but this is the only one I got permission to photograph. Now for that shoulder… I’m going to the doctor tomorrow and then I’ll know if I can continue typing during my recovery. Typing hurts a little, but it also gives me something to do besides sit and go “ow.” So if I’m silent, that’s why. Q: What state do dragons like best? PS: I’m at the RadCon SF con this weekend and there are dragons everywhere. If I get artist permission, I will have photos on Wednesday. Q: What cooking oil do dragons prefer? A: Extra Virgin olive oil! Q: Where do dragons like to go on vacation? As a chance of pace, I’m taking part in the Writing Progress Blog Hop, which I was introduced to by indy writer Charles Yallowitz. As in most blog hops, you’re supposed to “tag” a few additional participants, but I’m going to follow Charles’s lead and leave this open to any who wish to take part. So first, I want to thank Charles for having a great blog on writing and the writing life. It’s well worth your while to check out his blog, Legends of Windemere. 1) What are you working on? I just finished the third draft of The Grimhold Wolf, a gothic-style werewolf novel, about a woman who is turned into a wolf by her evil ex. The ex takes their kid, and Our Heroine strives to rescue him while trapped in the form of a wolf and dodging an obsessed, werewolf-hunting priest. While I wait for critiques to come back, I’m doing a total overhaul of my web site. I also have a couple of projects I’ve completed one or two chapters on, and I’ll be trying to carry those forward. 2) How does your work differ from others of the genre? Most of my books end up having to do with family relationships. For instance, in The Grimhold Wolf, Madeline is trying to rescue her son Charlie from his father, Alexander. So although there is a werewolf, there isn’t the big romance component that urban fantasy fans might be looking for. In most of my other books, the main characters are siblings. Again, not the basis of a traditional romance. So I guess you could say that I don’t follow trends and break as many genre conventions as I follow. I also expect that my readers are willing to think a bit and not just consume my books like popcorn. This could be why I’m not a famous best-selling author. The short answer is, for fun. I’ve never wanted to write anything but fantasy. Even when I write for kids, there’s almost always a fantasy element. I just love fantasy! I have a notebook for every novel I’m working on. Some are just spiral-bound and some are pretty, fancy journals that I picked to match the feeling of the project. I carry these around with me, and if I get an idea while I don’t have my notebook, I write it down and tape it inside the notebook later. That way, I have all my notes together if I need to look back at something. I do pencil drafts at lunch, when I’m able. (I work on call, and it’s different every day, but I take my notebook with me.) These are very rough and sketchy. After dinner, I take the notebook to my computer and put together a more finished text. After more than 10 years, I have my family pretty well trained that this is my time and anything less urgent than the house catching fire will just have to wait. I don’t even have to shut the office door any more. I work Sundays through Thursdays. Fridays I have a gaming group and Saturdays I leave open for doing stuff with my family. Major holidays and vacations are exempt, but I do pack my notebook, just in case. My goal is 4 pages a day — this allows me to complete a chapter in a week — and I always hope to finish my novels in 6 months but usually end up taking 9-12 months. Here’s where I tell you I’m a seat-of-the-pants writer rather than an outliner. I know where I’d like to go with the story, but keep things loose to provide for spontaneity. Honesty, to me, is the most important part of the story, followed by surprises. Maybe that’s why I can never follow formulae. So that’s it, fellow authors and bloggers. If any of you would like to carry the tour forward, that would be great. Next time, I promise, there will be less “me” and more dragons!